The number one question I get asked constantly isn’t how I manage money. It isn’t how I set up a budget. It’s not how I’m investing in my children’s college education. Many people want to know how I run a six figure business while taking care of twin toddlers and supporting a husband who is traveling all across the country for residency interviews. I’m going to weigh in, but first I want to show you how these 12 other highly successful mompreneurs make it work. All of the women below run their own businesses while also playing the role of mom. They are an inspiration to me, and I hope they are an inspiration to you too. “#1 – Quality is just as good as quantity. I’m not always physically present with my son, but when I am, I make sure my phone is down and the computer is off. I give him my undivided attention when we are together. “I would have to say it’s don’t be afraid to ask for help. That could be childcare help, help managing your finances or help from your significant other. I find that it’s hard to ask that first person, but once you do it gets easier and the feeling of ‘I have to do it all myself!’ slowly fades away. “I read on an inspirational blog somewhere that as moms & professionals, we should ‘Measure ourselves by a standard of grace rather than a standard of perfection.’ This doesn’t mean we can slack off. What it does mean is that no one is perfect – in fact, ‘perfection’ is just an illusion sold to us by television, magazines, and even other moms at the gym. Everyone makes mistakes and everyone fails. When we can’t get it all done, or when we make a huge mistake, it is best to own it, and then move forward from there. When we’re feeling crazy productive, embrace it. And when we’re feeling neglected, that means its time to delegate and take a little time for ourselves. “On the surface, it’s easy to think that motherhood and entrepreneurship are like oil and water – that they can’t mix. That hasn’t been my experience. 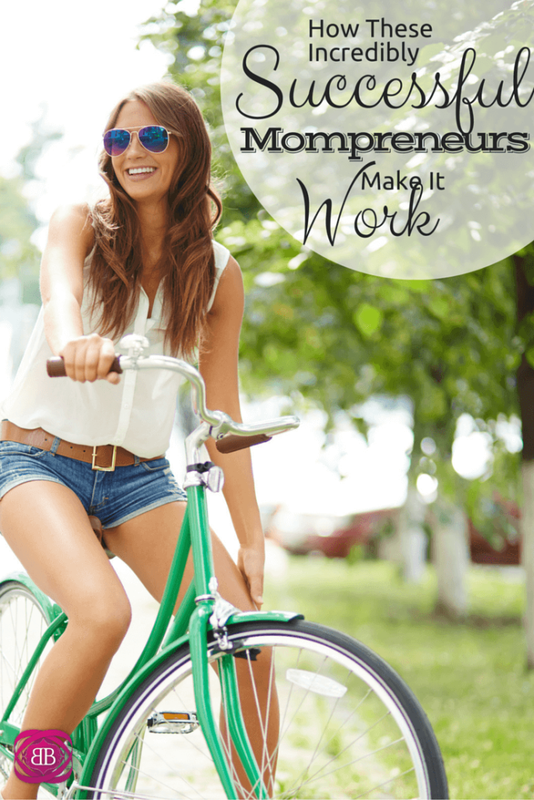 Motherhood was the impetus for me becoming an entrepreneur. I was pregnant with our first child, and knew I wanted to be at home with her, yet we couldn’t afford to be a one income family. I had to find a way to make money that would allow me to be at home with our daughter. I put my writing and advertising skills to work and pursued a career as a freelance copywriter. While it was rough at first, 6 years later business is booming and I’m transitioning into hiring others to handle the work and expand operations. With three little ones now to care for and a business to manage, life is full 🙂 However, I keep it from getting out of control by scheduling my day around my kids’ needs. As much as possible, I try to write when they are napping, sleeping or quietly working in the afternoons (something I’ve trained them to do 🙂 ) I also had to accept that our lifestyle and schedule is not normal. Most couples don’t work together from home with young children. When I realized I didn’t have to be like everyone else to raise successful, well-adjusted, happy adults, I stopped stressing so much and learned to be grateful for what we’ve got going on. Well, now it’s my turn to tell you how I manage my business and responsibilities as a wife and mom over here. I have to echo all of the amazing mompreneurs above, and I have to say, it was so refreshing to hear from all the women above and know that many of us have the same struggles and are on the same boat. The way I “do it all” is very simple: I outsource as much as possible. I have someone clean my house every two weeks. I have a nanny who comes three times per week. I have a husband who grew up in a house where his mom and dad worked together. His dad is often doing dishes, cleaning counters, and cleaning up, and my husband is the same way. I also have a strong passion for my work and a solid work ethic. I feel a lot of pressure to make an income and provide for my family, and this fuels my work every day. I also have an amazing assistant in my business who helps me tie up loose ends and keeps me sane. I’ve stopped trying to be everything to everyone, and I’ve stopped trying to do it all. I realize that if I hire quality people and work together with my husband, a sense of normalcy is possible. In the future, I will elaborate more on how I arrived in this good place – this place of working hard, growing a business, and enjoying motherhood because it wasn’t always this way. At first I was stubborn and I tried to do everything. I had a lot of highs and lows in the first few years as a mom and business owner. I was tired, sleep-deprived, and even depressed. There were many times when I wasn’t sure if my business would survive at all, but I’m happy to say that we are thriving. Much of this comes from nearly two years of working out the kinks and having the support of other women who are trying to be entrepreneurs and mothers. Thank you again to all the women above for taking the time to offer a quote for today’s post, and if you have any questions about being a mompreneur, please leave them in the comments below! I’m here to help! Very inspiring! Accepting help can be so hard, especially for highly motivated women, so it’s no surprise that is such a refrain. Cat!! I think this is my favorite post written, like ever!! This was SO inspiring and is something I am bookmarking for when I feel like I’m in a jam. This also came at such a good time – running a business and being a mama is hard, but I think one of the best things about it is that your kids can always come first. That’s not always the case with a FT job. My youngest has been so sick, we actually had to take her to the ER yesterday. Blogging has fallen to the wayside, as have all my other duties. BUT, the beauty is that I work for myself (mostly, haha). It’s ok! THIS is why I’m a WFH mom 🙂 Thank you for this post and the awesome encouragement from so many mamas and entrepreneurs. And thanks a million for including me on this awesome list!! I’ll have to agree with Sarah, the best thing is being able to make sure family comes first. I work from home for someone else in addition to my freelancing responsibilities, but my job understands that I prioritize my kids over work. I will not neglect my home because of work. I make sure that home is happy and my employer is satisfied with the quality of my work. It’s possible to achieve balance without neglecting the other. That’s awesome Latoya! Not many work from home jobs (other than being self-employed) are that kind and flexible. It sounds like a great opportunity for you. What a great post! Thanks Cat! LOVE this! You moms rock!!! 🙂 I’m so glad to know each and every one of you! Accepting that you just can’t do it all is the hardest part. I’m not sure why working Moms feel the need to be perfect but we do! Thanks for sharing these stories and making me feel ok about asking for/hiring help. This is something that all working moms seem to struggle with, at least all the ones I’ve talked to. I’m trying really hard to do better about knowing my limits and asking for help, but it’s definitely a work-in-progress. Nice roundup of great comments from smart, successful women! As I lay the foundation for my own “mompreneurship,” I find this to be great and helpful insight. Thanks for the inclusion Cat. Awesome to see what you’re doing. Keep it up! I found this post to be very inspiring! It’s my dream to own my own business someday so I can work from home and be with my kids. Definitely bookmarking this! That’s awesome! I hope it works out for you. Working from home and being with my kids more is the best thing about my business. So honored to be a part of this amazing group!! We know that being a working mom is tough, but I wouldn’t trade it for anything. I love to work and I love being a mom. Thanks for this post! I often get asked this question – by people who don’t even know about my blogging and side hustles. I agree with most of this advice, especially that balance is achieved in the long run (as opposed to day by day) and that you need to delegate things to your spouse. Very inspiring post, Cat! I’ve always believed it takes a village to raise a child. Women in general need to learn to stop trying to do it all. I’m glad that at least some of us have gotten better at realizing that it’s silly to try to do it all yourself. I’m still trying to learn to delegate, and I don’t even have kids — or a six-figure business! Like Shannon said, the important thing is quality over quantity. Rather than trying to do 10 things, just do a few of them well (and make enough money to delegate the rest). This is what we call girl power, Cath. I am inspired by each of these women. Thanks for sharing the list. When I’m a wife and mother the first thing I’m doing is getting cleaning help (mom is already helping with future kids) there is no way that you can do everything on your own. An absolutely inspiring and awesome list! Wow, you guys are all really incredible. I feel a lot of this advice is great for how to build a strong work ethic even if kids aren’t in the picture. Prioritizing and delegating go a long way. Thanks for the mompreneur tips. I am not yet in the mompreneur role but I’m on my way. Still working full time but getting ready to move to the Caribbean and boy oh boy – I am starting to shake in my boots so I needed this information. I do agree that having a schedule is very important but not always easy to stick to. So I somehow stumbled upon this post and, after looking at all of the previous commenters, I’m clearly out of place here – I’m not a woman or a parent. Regardless, I find your story and that of all of these other great moms inspiring. Although I believe that moms may be a bit super-human, learning how all of you have run businesses while being moms gives me confidence I can do it as well (run a business that is, not be a mom). Thanks for sharing these great tips and I will undoubtedly check out more of your posts for future inspiration! Really useful and inspiring post 🙂 thank you !